Combination magnetic/write-and-wipe-off board and a flannel board all in one. Free-standing wooden easel with a tray on both sides. Measures 47" H. x 24" W. x 26½" in depth at the base. Magnetic Letters & Numbers are sold separately. 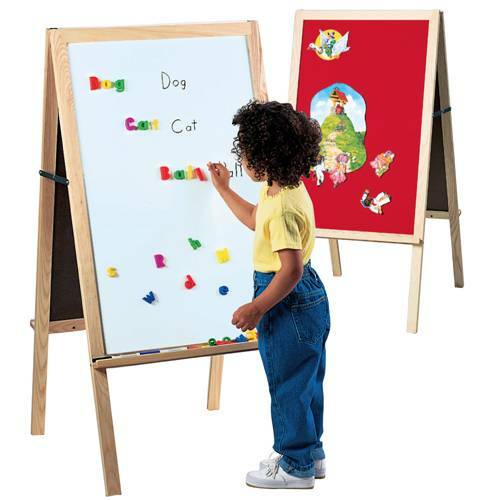 A combination magnetic/write-and-wipe-off board and a flannel board all in one, free-standing wooden easel with a tray on both sides to hold markers or prop up a Big Book for display. Folds for easy storage. Measures 47" H. x 24" W. x 26½" in depth at the base. Magnetic Letters & Numbers are sold separately.